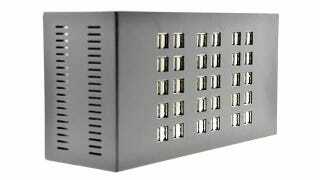 It’s nice to think that this massive 60-port USB charger will eliminate the battles over available power outlets in your home, allowing everyone to charge all of their mobile devices at the same time. In reality, though, it’s probably only going to buy you a couple of years of sanity before you run out again. But a few years of peace and tranquility is better than no years at all. And with everyone charging their mobile devices—including smartphones, tablets, and fitness trackers—from a central spot in your home, it could mean fewer devices getting misplaced or accidentally forgotten. At $130 for the 60-port version you’ll be paying a premium for that temporary charging cease-fire, but cheaper 40 and 20-port versions are also available. Just remember that one everything from self-adjusting smart belts to your socks will probably need to be charged, so why not stock up on USB capacity now?